At InfoComm 2014, Las Vegas, Booth C5446, Elation Professional debuts several new products including the world premiere of the new EMAG 4 Pro, a 4.8mm pixel pitch LED video panel optimized for the high-pace 'setup/tear down' frequency of on-the-road productions. 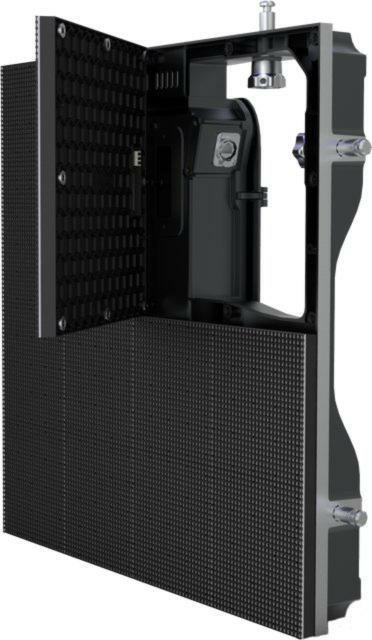 Also featuring in Elation’s growing line of LED video displays will be the EPT9IP, a bright 9mm pixel pitch LED panel suitable for a range of professional LED display applications. Designed for the demanding production market, the new EMAG 4 Pro is a durable, 4.8mm pixel pitch LED video panel ideal when outstanding high-definition image quality is required for on-the-road productions. Built of rugged die cast aluminum, tool-less quick locks and a magnetic module design make the EMAG 4 Pro easy to assemble and disassemble. Colours display vivid and consistent and a brightness level of 1,200 nits means the EMAG 4 Pro performs well even in high ambient lighting conditions. Designed to provide outstanding image quality, the EPT9IP is a bright 9mm pixel pitch LED panel with 4,096 3-in-1 LED pixels per panel (64 x 64), suitable for professional LED displays. It incorporates the latest dot correction technology for superior colour and brightness uniformity and delivers 5,000 nits of brightness, more than sufficient for any indoor use and bright enough for virtually any outdoor application. Integrated curving options from -15° to +15° allow designers to create a variety of seamless curved video displays. Debuting on U.S. soil at the Las Vegas Convention Center June 18-20 are three new luminaires in Elation’s Platinum range of professional moving heads – the Platinum BX, Platinum SBX and Platinum Profile LED – two discharge lamp-based and one LED-based. The Platinum BX is a compact yet powerful beam luminaire that combines new lamp technology from a Philips MSD Platinum 17RA 350W lamp with a new optical system to kick out over 15,000 lumens of power. The Platinum BX is fast and delivers extreme output along a tight 2.5 degree beam at 4 times the level of previous beam models. It also features 11 dichroic colours including UV, CTO and CTB, along with 13 fixed indexing gobos. A rotating 8-facet prism and frost filter are also included. The energy efficient Platinum SBX is an innovative full-featured 3-in-1 luminaire which can be utilized as a beam, spot, or wash fixture. This compact fixture combines new lamp technology from a Philips MSD Platinum 17RA 350W lamp with a new optical system for a flat field of light and kicks out 20,000 lumens of power, comparable to 700W fixtures. It also features a zoom, 13 dichroic colours including UV, CTO and CTB, plus nine rotating interchangeable gobos and 14 fixed gobos. A beam shaper, rotating 8-facet prism and frost filter are also included. The Platinum Profile LED is a full-featured professional LED profile lighting fixture with flexible 4-blade rotating framing system. It uses a new high-performance 180W LED engine for an output that is comparable to a 575 discharge lamp. Beam angle is 18° and the fixture offers seven dichroic colours including UV, seven rotating interchangeable gobos, and seven fixed gobos. A 3-facet rotating prism and frost filter are also included. Other Platinum range fixtures on display will be the Platinum Wash 16R Pro and the Platinum Profile 35 Pro.